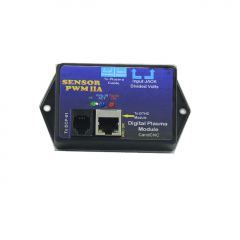 PN200 Hand Controller without the C3BUS USB to RS485 communication hub. If you already own a C3BUS to RS485 Communication Hub, you should select this PN200 Hand Controller option. Control virtually every aspect of your CandCNC based machine from the palm of you hand! This is not some “game” controller or limited function MPG for just jogging your machine around. The PN200 is a full-featured HAND CONTROL that puts total control of your CNC machine at your finger tips. The PN200 is extremely versatile and tied tightly to both MACH and CommandCNC (any action on the PN200 shows on the console and screen, and any console action shows on the PN200). You can quickly see the status of critical settings on the front of the PN200 with the multiple status LED’s. Most are two-color LED’s, so several states are easy to display. If you need to see the important objects on your screen (like XYZ DRO’s, Feedrate and override numbers, THC settings/numbers, etc) just click on the PN200 “SCREEN” button and up pops a custom screen on your monitor with huge readouts you can see across the room. From the PN200 you can move, (4 selectable Jog speeds/ranges) using the Keypad or from the 360 deg Proportional Jog Stick. Ultra slow jog and single step mode lets you get as precise as you need. Switch back and forth with a single button press. You can do all of the pre-cut setup (zero, reference, home, run macros, etc) with ONE FINGER. You can control your CandCNC DTHC plasma control directly from the PN200 including changing Preset Arc Volts (arc gap) while you cut!. The PN200 is truly a breakthrough in CNC “pendants.” It frees you from running back and forth to the keyboard when you are running the table. Once you load the G-Code to cut into the PC, you can do the rest of the Setup and RUN from the PN200. Put a big monitor at the PC and make the system almost totally remote. The PN200 is now supported for Linux based operation with CommandCNC. Please be sure to update to the most recent release of CommandCNC to download the necessary drivers. PN200 FEATURES LIST Single Hand Operation 29 Buttons, 2 rotary encoders Multicolor indicators (LED's) Synced with MACH and PC keyboard (parallel operation)> Built-in fail safe system E-STOP stops machine if unit is unplugged. Single button settings for Jog Speed, Step Increment. 3 Dedicated single button Macro's. Up to 90 additional stored Macros. "Big Screen" toggle allows computer monitor to be seen over 10ft away. Auto Mode switching from SETUP to RUN and back> 360 Deg Proportional Jogstick allows two axis moves and switches between Primary (XY) and secondary pair (ZA). Keypad jog keys allow single direction jogs at a selected feedrate. 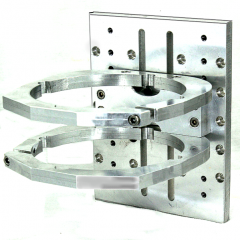 Remote control of virtually any MACH function. Rotary Encoder control of DTHC Preset Volts (even while cutting) . THC On/OFF switch Rotary Encoder control of Feedrate Override. Tactile sealed keypad. 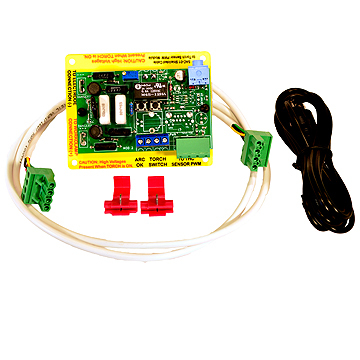 Operation on reliable, noise immune, RS485. Up to 100ft from controller PC. ** INTERLOCK (two button activation) for turning ON any Output from the keypad. Indicator to show unit has correct communication to PC and to MACH. Exclusive PROGRAM MODE allows input of MDI (single line) G-code and execution from the keypad. 4 selectable Jog Speeds (rates) 3 selectable JOG INCREMENTS Single Step Mode allows for precise position control and work touch-off Lightweight and rugged. Uses single small UTP (CAT5) cable for connection. **USB to RS485 Communications Module Sold separately.